Cyclist killed in La Quinta, bike plan passes Planning, Vail hit-and-run driver walks, and goodbye Aurisha. A cyclist was killed in a hit-and-run in LaQuinta, near Palm Desert, on Tuesday afternoon. Fifty-six year old Joseph Patrick Szymanski was killed while riding on Avenue 54 in La Quinta about 3 pm Tuesday afternoon. Firefighters pronounced him dead at the scene; his body was found lying in the bike lane, though authorities note that they don’t know where he was when he was hit. Tracey Salter of Merriam, Kansas woman was arrested an hour later about three miles away on suspicion of felony hit-and-run. The article notes that a police spokesman didn’t know if Szymanski was wearing a helmet. But unless he died of a head injury, whether or not he was wearing a helmet is irrelevant. And even if he did, there’s no reason to believe it would have helped unless he was struck at slow speed. After years of contentious debate, the draft bike plan passed the city Planning Commission with near-unanimous support from the cycling community. The only serious disagreement came from equestrians opposed to allowing bikes on off-road trails, updating a conflict that goes back to the earliest days of cycling. 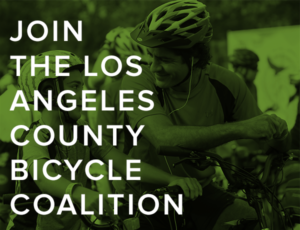 According to the LACBC, the plan will now go to Mayor Villaraigosa’s office for review before heading to the City Council in February for final approval. Time to add Vail to your biking boycott list, after the schmuck driver who ran down a cycling transplant surgeon and left him lying critically injured on the side of the road — claiming it was a result of that new car smell — walks with a year’s probation and a suspended jail term. That’s after the local DA declined to press felony charges because it could affect the driver’s high income career; by that standard, every rich sociopath and over-privileged jerk who commits a crime should get off the hook. And from the looks of it, it’s possible that one just did. 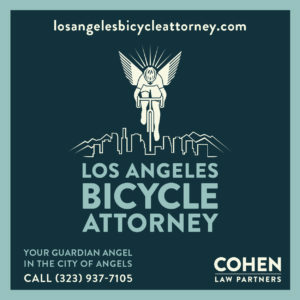 Damien Newton talks to the Beverly Hills cop who seemed to suggest a correlation between cyclists and criminal activity; turns out he’s one of us. And didn’t mean it that way. In non-wheeled human powered transportation news, Bikeside reports on the impatient hit and run driver who critically injured a Santa Monica pedestrian. And while we’re on the subject, Dj Wheels notes that Moran Bitan, the 18-year old driver who killed a 16-year old Notre Damn High School cross country runner Conor Lynch, faces a pretrial hearing on the 27th at the Van Nuys courthouse. 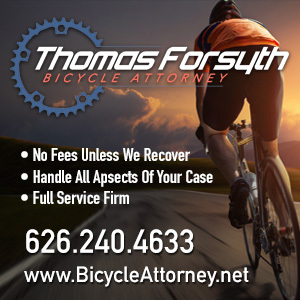 And still no charges against Stephanie Segal in the alleged drunken hit-and-run death of cyclist James Laing in Agoura Hills this past October. Nice KCET interview with L.A Bicycle Coordinator Michelle Mowery about riding the L.A. River; thanks to Bicycle Fixation and Flying Pigeon for the heads-up. Speaking of Flying Pigeon, they’re getting four new Velorbis bikes just in time for Christmas. Or maybe you’d prefer a very cool and unique looking chainless STRiDA folding bike. Another street falls victim to the stupidest and most dangerous law in California. Employees of the San Diego Metropolitan Transit System buy a new bike and helmet for every first grade student at a local elementary school. CalTrans pushes for a bike lane to nowhere in Bakersfield. Berkley is the most dangerous California city of its size for cyclists, pedestrians and conservatives. Evidently, you can have a good ride in Sacramento, even without Lycra. Ross Del Duca continues his thoughts — started here — on divisions, divides and cultures that divide cyclists, or not. California releases the new standards for complete streets. The SF Gate discusses why and how to register your bike; in addition to the National Bike Registry and Stolen Bike Registry mentioned in the article, I like the free international bike registration program from Bike Revolution. Something tells me this app intended for motorists will prove very popular with cyclists. A women’s bike team can be run for just 5% of what it costs to run a men’s pro team. Bike before breakfast to maximize weight loss and other health benefits. If you think you’re tough, try racing 150 miles through the Alaskan wilderness in the dead of winter. The New York Times points out that there are laws against bad bike behavior. Philadelphia drivers love the city’s new parking contraflow bike lanes. Just in time for Christmas, get an official crown of thorns helmet so you, too, can suffer like Jesus while you ride. Finally, if you’re going to ride your bike on the sidewalk in Santa Monica, leave your meth and crack pipe at home (scroll down to Monday). And a new study discovers the cause of San Francisco’s traffic problems: cars. On a personal note, best wishes to LACBC’s Aurisha Smolarski, who’s moving on to pursue other career goals. In the 2-1/2 years she’s been working with the bike coalition, I’ve watched Aurisha grow to become one of the city’s most effective advocates for cycling, and a friend. 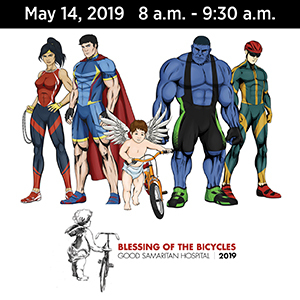 She has arguably done as much as anyone to improve the state of bicycling in Los Angeles, often working quietly behind the scenes to fight for the rights of cyclists and set the stage for our budding biking renaissance. She will be very missed. It irritates me when reports of car/cyclist collisions include whether the victim was wearing a helmet. A helmet is not a collision-prevention device. Maybe whether the cyclist had the legally-required light or reflectors is relevent, but helmets have nothing to do with it. Saying the cyclist wasn’t wearing a helmet seems to imply the cyclist was asking for trouble. On top of that little rant, helmets are rated for impact speeds up to 12 mph. I’d love to know where I can find cars traveling that slowly in Los Angeles. Apart from on the 405, of course. No charges against Stephanie Segal of Woodland Hills for manslaughter? What is the LA County District Attorney waiting for?